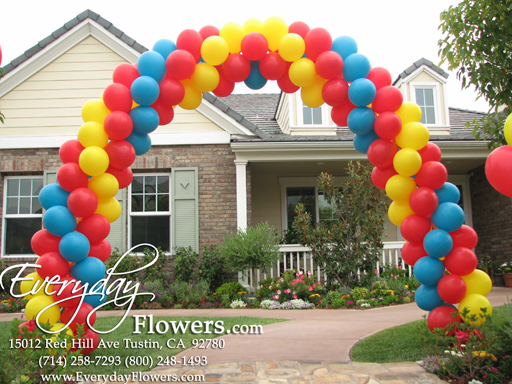 Order a Balloon Arch For any event located in Orange County California. Our Experienced Balloon Artist can create any size and color arch for your event or party. Balloon arches are constructed on site by our staff. This balloon arch is constructed by tying together four balloons and placing the balloon sets next to each other. You can choose up to 4 colors and can be made by creating the serpentine effect throughout the arch or we can invert the center of the arch. 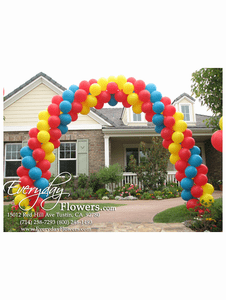 You will need the height of the arch and the width of the arch to determine how many balloons it will require to create your custom size arch. Our balloon arches are based upon the number of balloons that are needed to create and arch. The length of the string of balloons determine the size of the arch. Balloon Arch Prices And Sizes. Setup and Delivery starts at $50.00 depending upon Time and Location of your event. We will come to your location or event and create the balloon arch on site. Our normal setup times take place between 9AM to 4PM Monday Through Friday and Saturdays from 9AM - 2PM. Setups that take place outside of those hours will have an additional charge depending upon when and where. Everyday Flowers is a fully insured vendor. Please make sure to check with your location for proper insurance and permit requirements including public locations such as public parks. Our location is fully stocked and can accommodate last minute orders including same day service. It is always recommended to place your order at least 1 week in advanced so that we can provide the exact colors for your custom balloon pieces. Last minute orders are welcomed so please let us know how we can help you. Public Parks, Sites, and Venues may require special permits for balloon arches and balloon columns to be constructed on site. Please check with your venue coordinator. We are a fully insured business so all required insurance information can be submitted to your venue.